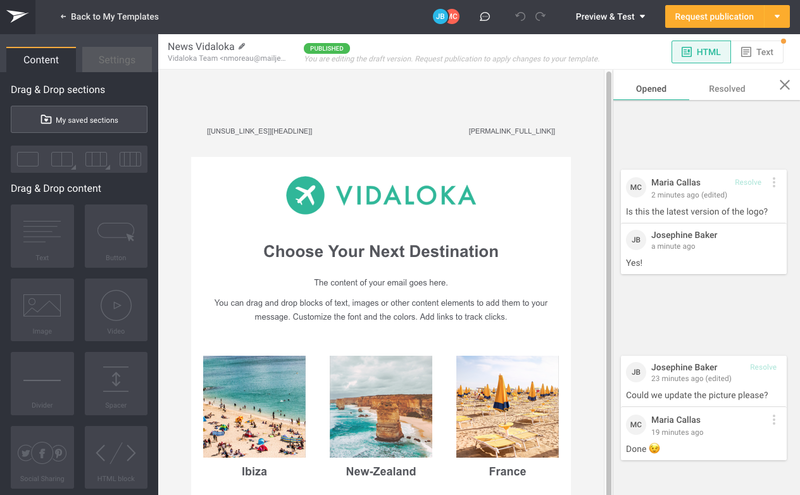 Mailjet, a French-based email service provider (ESP), just announced the arrival of comments in their email builder. This new feature transforms the way teams work on emails in terms of email template creation and validation. Just imagine that you have created a set of beautiful email templates for Black Friday and Cyber Monday. As usual, your entire team is pretty busy and you just need to get that email approved by the end of the day. Now you don’t need to waste any more time by going back and forth via email, phone, or Slack. Simply add comments directly to those blocks in the template builder where you would like your team to work on. Note that this feature is only available for Premium plans and when working on email templates, but not in campaign mode.